Plan de l'Isle Junseilon, et de son Port. This is a scarce 1775 nautical chart or maritime map of the port and harbor of the Island of Phuket, Thailand by Jean-Baptiste d'Apres de Mannevillette. 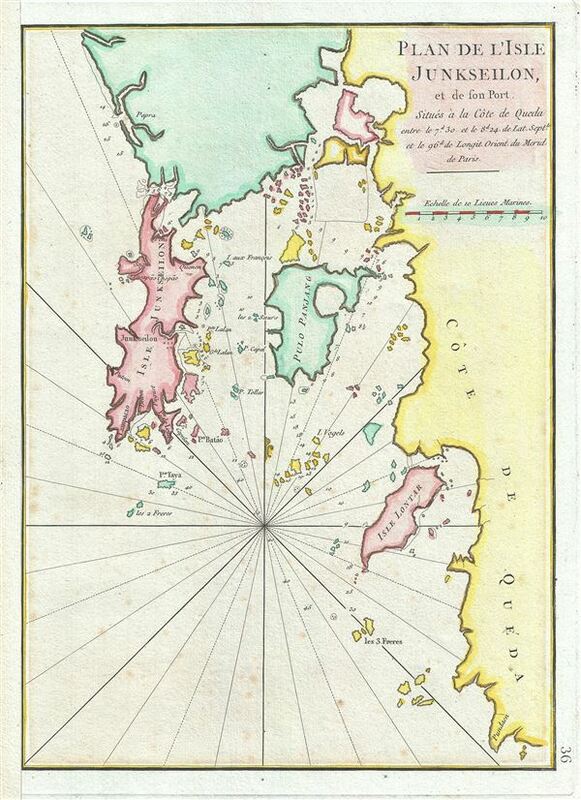 It details the Island of Phuket or Junk Ceylon along with its harbors and the coast of Queda (Kedah). One of the earlier maps to show Phuket in detail. Today Phuket is one of the most visited islands in the world a major center of Thai tourism. In the 18th century Phuket was located on one of the important trading arteries between India and China, as well as being itself a rich source of tin and rubber. The basic cartography of this map dates to Mannevillette's voyages as pilot for the Compagnie des Indies in the early 1700s. It was originally published in Paris in 1745. This may well be the 1745 edition, but it is unclear as no major changes seem to have been made between the first and second editions. In any case it was republished in 1775 in an expanded second edition of the Neptune Oriental. Very good. Original platemark visible. Left margin extended.